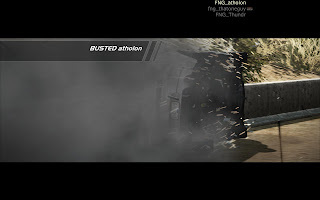 "Santa" dropped a special gift in Atholon's Steam account this morning and helped him join the other FNGers playing Need for Speed: Hot Pursuit. We "gave it a spin" tonight with Thundr, who got his settings worked out so he can play with us too. The first several runs found myself trying to bust both Thundr and Atholon, and while I came close a few times, was never successful. Then we switched to me running from them as a lone racer... and you guessed it, couldn't get away. It was fun though, so we all started taking turns being the lone racer, on a quest to be the first one to evade the cops and win the race. I was finally victorious on one run where I missed what we thought was a shortcut... Atholon attempted the shortcut only to find it was a dead-end. 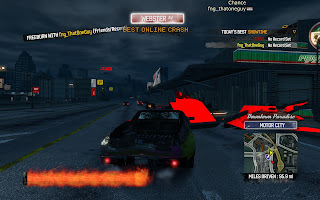 Thundr ended up with a fatal crash that took him out of the race as they tried to catch up with me. A few miles later, the finish line was finally in sight. I checked my radar and saw Atholon quickly approaching; but it was too late. First lone racer victory of the night. 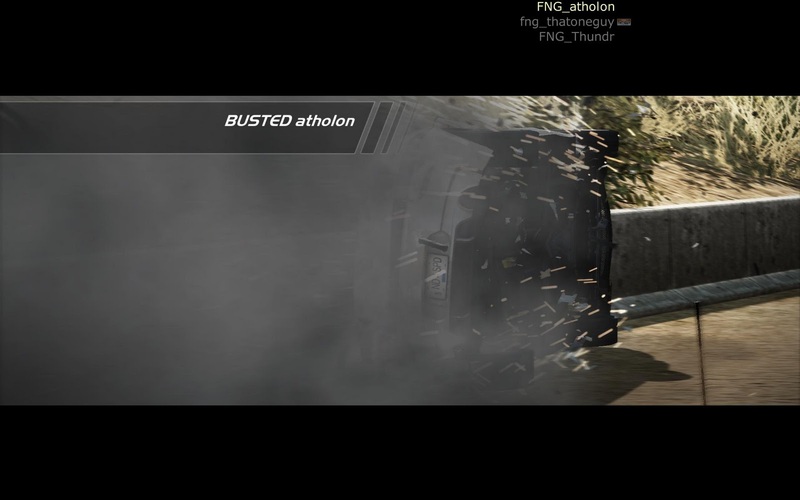 Our final race had Thundr and myself chasing Atholon. 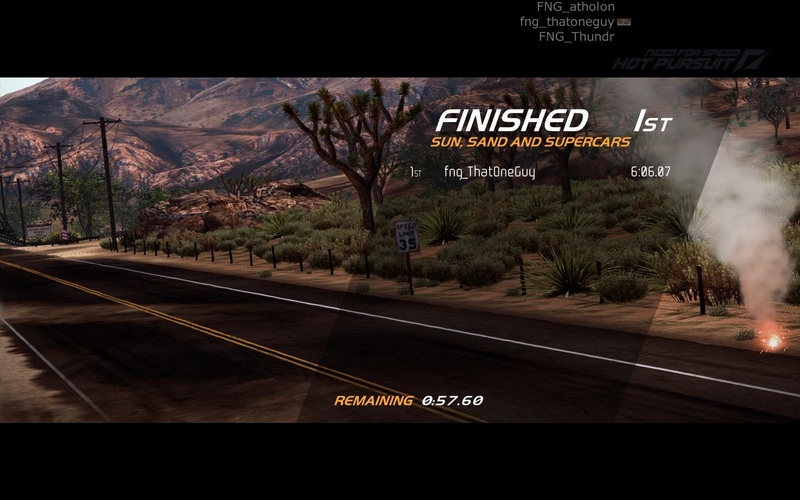 Thundr unfortunately wrecked out of the race, and it left me tailing Atholon for the next 5 miles. Those 5 miles had us careening through the streets, myself ramming Atholon's car as often as possible, and Atholon hitting the brakes and letting me fly on by as often as possible. It came down to the wire, and we thought there would be a 2nd lone racer victory for the night; but I finally got that last bash in... cops win. So close... yet so crashed... BUSTED! It goes without saying that we had a good time... did I mention this game FREAKING ROCKS?! I'm also happy to report that we had no connectivity issues as far as getting gamers into the lobby was concerned. Jarin had one drop out of the game, but it was due to alt-tabbing out to capture the screenshot you see above... now we just need to get eight of us together at once instead of little 2's and 3's here-and-there. I happened to catch SpeedMonger on IM tonight, so we decided to test some of our connectivity issues. We have previously had problems with Split/Second and Need for Speed: Hot Pursuit. Earlier in the week, when we had our problems with Hot Pursuit, one of my computers was able to connect, so I checked my router settings to see if I'd maybe been forwarding some ports to that computer for another game that might be interfering with ports Hot Pursuit uses. I found that I'd been forwarding Titan Quest ports to that machine, so I assume it was the cause of our dilemma the other night. 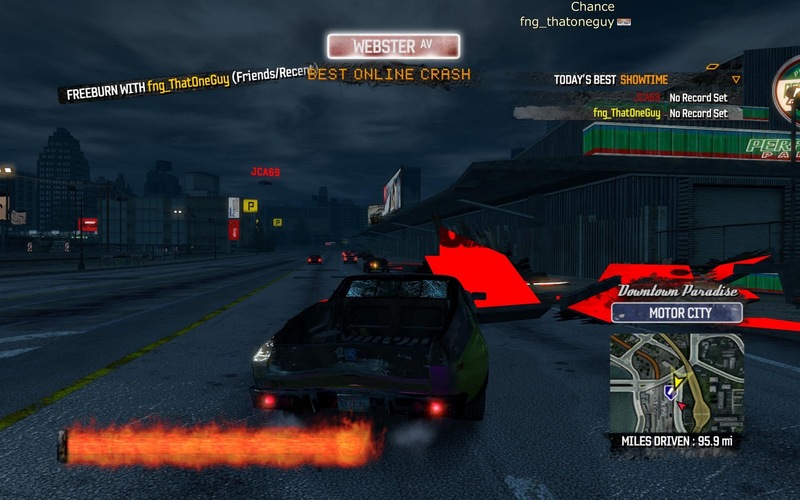 I turned the port forwarding off for that game, and we commenced testing out Burnout Paradise first. We connected fine and spent an hour free roaming and taking each other down, as well as trying out some of the events in the game. It was a good time. Some of the most memorable moments of the night were us trying to get the biggest drift in free mode inside a stunt quarry. We were constantly attempting to take each other down to stop the drift, and SpeedMonger was successful in stopping me several times. SpeedMonger is only missing 8 billboards before he has them all, and one of the events we played brought us to the parking garage that has the launch ramp necessary to reach the billboard. After we figured out which ramp we had to take, we both started trying to make the jump onto a building's roof across the road, required to launch through the billboard in question. Below is the the screenshot of the scene where the billboard is. I was first to break it, so I pulled my car next to the fragments (bottom-right of the screenshot.) The billboard was on the edge of the canopy roof you see on the building to the right of my car. In the distance is SpeedMonger (JCA69 on EA games) attempting to make the jump to the roof. you see lying broken in front of me. 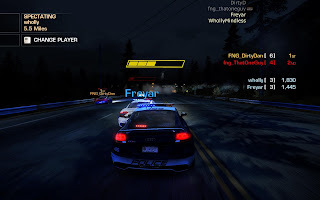 We tried Hot Pursuit next and were successful in connecting to each other! Since there were only 2 of us, we ran 3 Interceptor courses: SpeedMonger racer and myself as cop first, then 2 more vice-versa. We had a blast (literally - EMP anyone?!) and I look forward to getting SpeedMonger in on some games with more players in the future, hopefully. DirtyDan, about to be busted by WhollyMindless and Freyar. ahead ready to drop a spike strip on him! Well, I have mixed feelings about tonight's Hot Pursuit action... the action was great, don't get me wrong, but getting the action started was a hassle again tonight. I hope whatever network weirdness is going on with the game's seemingly "auto-resolving" will get worked out by Criterion/DICE or whoever was responsible for the networking code. I'd rather do some port forwarding or something if it would let us all connect fine. Hopefully we'll find a new patch or workaround soon so we can all play together. Dragonflye gave up and dropped out for the night, and the other four of us were able to connect fine and race for a while. We switched off for 2v2 Hot Pursuits, with the teams being DirtyDan and myself, vs. WhollyMindless and Freyar. We took turns being cops and racers, swapping each round. We had a ball and I was bummed when I had to bail for the night... but the picture you see above was of the final moments of the final pursuit. I'd been taken out early in the game by WhollyMindless, who placed a roadblock in just the right spot to ram me into and totally sandwich me in, preventing me from backing out before the "busted" timer removed me from the game. This left a lot of time for Wholly to catch up with Freyar and use the outnumbering advantage on DirtyDan. I got to spectate the whole thing and witness the intense conclusion you see in the screenshot above. One of the cops had called in a helicopter, while the two closed in on Dan. You'll notice that Dan and Freyar were both in "Critical Damage" mode where either could have been removed from play with one more good hit to their vehicle. Unfortunately for DirtyDan, he was the recipient of the final blow. Once we got playing, the action was good, with rare little spots of lag. Again, we hope we can figure what's causing some of us to not network nice together, so we can get a full game going and all enjoy this great game. Check out the Mumble overlay near the top-right corner. Well, Christmas night was a blast. 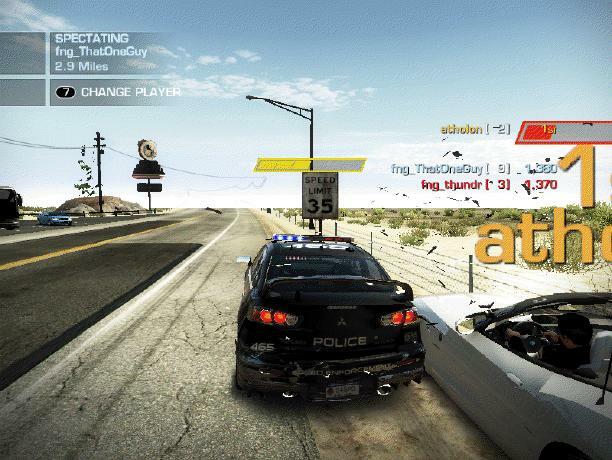 And while Need for Speed: Hot Pursuit isn't without glitches, it's a pretty dang nice experience for the most part. We were hoping we could get all of us into a game, but for some reason SpeedMonger has a problem connecting to ThatOneGuy, but only with certain computers from my home. As mentioned before, my two kids joined us, and for some reason, d6Amefath3r could join SpeedMonger and BomaJoe and play a few rounds, but anytime Mando or myself joined with them, if SpeedMonger was in the game, we couldn't join, and vice versa. d6Amefath3r was having problems with the game crashing to the desktop with no error randomly too. Hot Pursuit involves cops trying to stop the racers during a race they're having along the Seacrest County roadways. If the racers reach the finish, they win. If the cops shutdown the race by taking the racers out, the cops win. It was definitely interesting trying to stop the racers as a cop, and exciting trying to finish the race with the "po-po" on your tail. After midnight, I excused my children to bed, and BomaJoe excused himself; which left DirtyD and I to our lonesome. 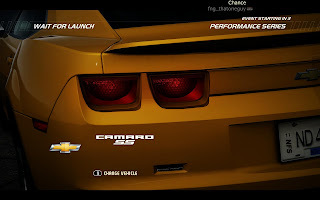 This mode is interesting, in that it plays more like Need for Speed: Most Wanted. 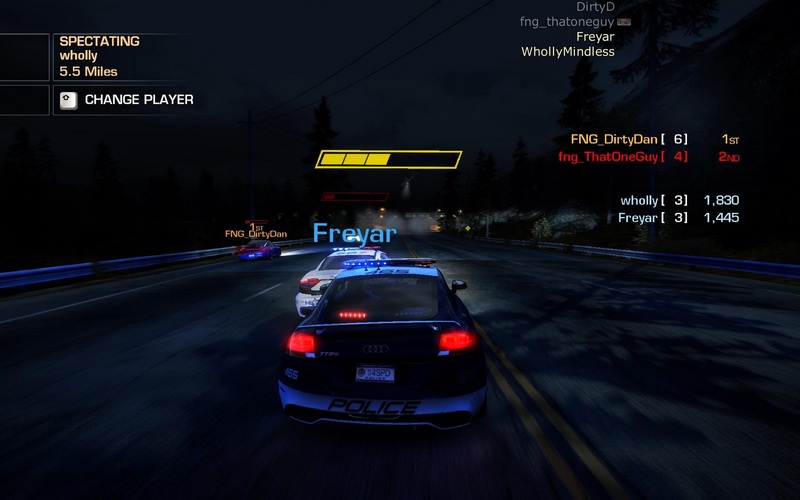 The cop chases the racer until they are able to take the racer out; or the racer evades the cop until they can get out of its range and go through a 30-second "cool down" timer. 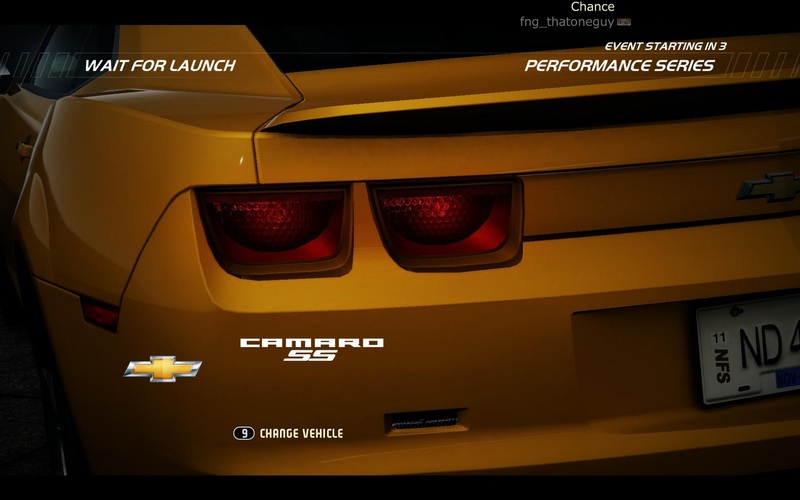 It's more of a free-roam mode where you're not locked into a given way to go on the track, like Hot Pursuit. DirtyDan and I found each other pulling a lot of handbrake 180's, trying to evade each other, and have some really funny moments I wish I'd FRAPSed some screenshots or video of. One of the funniest moves of the night landed me one of our first "escapes" in Interceptor mode. DirtyDan had about exhausted his supplies of helicopters, EMPs and Roadblocks (still had some spike strips), on this track that was nighttime and raining. On his last attempt at unleashing the fury of his EMP shockwave on me, I used the first of my "Jammers" to stop the shockwave and disable his radar. I can't remember, but I might have dropped a spike strip myself at that point to help slow him down too. I then immediately kicked in my Turbo to try for a speedy getaway. In the meantime, I'd wait for one radar jammer to finish, then immediately launch another; and continued this until I'd exhausted them all... which gave me enough time to evade DirtyDan far enough to get my cool down and complete it. We shared some good laughs over that and other fun rounds of Interceptor. 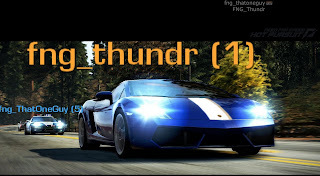 Thundr's system unfortunately fits the mold of the minimum requirements for the game; and they proved to act like sub-minimum requirements. Thundr had some trouble getting connected initially, but it seemed to work itself out for 5-6 Interceptor rounds. Then it seemed to kick him out of every game after that. One aspect of the game I forgot to mention is the Autolog. 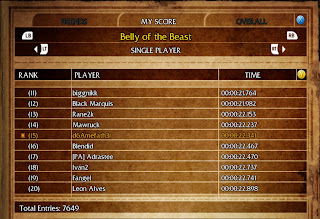 It keeps track of the top scores of your friends in the different events throughout the career modes. While Thundr was making tweaks, I'd periodically go back to some of the career modes and run a round or two, and was able to successfully claim #1 spots on some events, or raise my standing on the "Speedwall." That will add some extra fun to the game when we can't be online playing each other. Anyway, if you don't have it... snag it. If your computer won't handle it, upgrade it! :) I think this game's going to stay for a while, and we'd love to have you join us. Hopefully we can work out whatever kinks we've experienced so far (or that EA/Criterion will and give us a patch) so we can all enjoy the game to its fullest potential. 15th in the world; out of 7649 official times! That's right... that's my son! 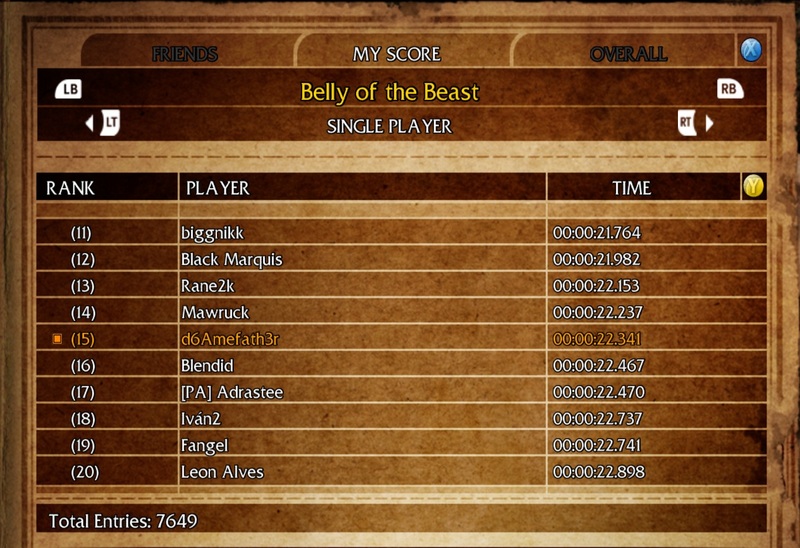 15th in the world for Speed Run record time on "Belly of the Beast" boss in Lara Croft and the Guardian of Light. If you haven't played it already, it's a fun Tomb Raider game with a different view angle than its predecessors. It also allows co-op play both network and at the same machine. 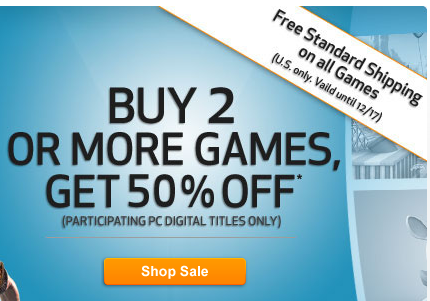 It's got a nice $14.99 price point on Steam too! Atholon, Thundr and myself played tonight in some grueling matches of Split/Second. 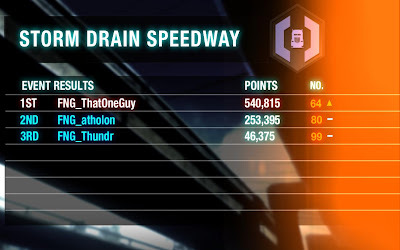 The starts of the races are hilarious, because whoever is in last place when Thundr is playing, gets shoved back by the other cars due to a game glitch that we believe has to do with load times and how fast/slow one connects to the race. I'll be sure to capture the shove-back phenomenon with FRAPS next time we play, it's pretty funny; and gives everyone else a 10-20 second handicap, for the win! We played several rounds of Survival, including an epic run where I was able to pass 10 trucks before a wreck, then another 11 during the end of the round and sudden death. After that we ran several races, racing nearly every track before it was time for us to start dropping off for the night. We had a great time, and hope we can get more FNGers to join us so we can get a full game of humans and see what kind of explosive mayhem we can cause then. Join us will you not?! 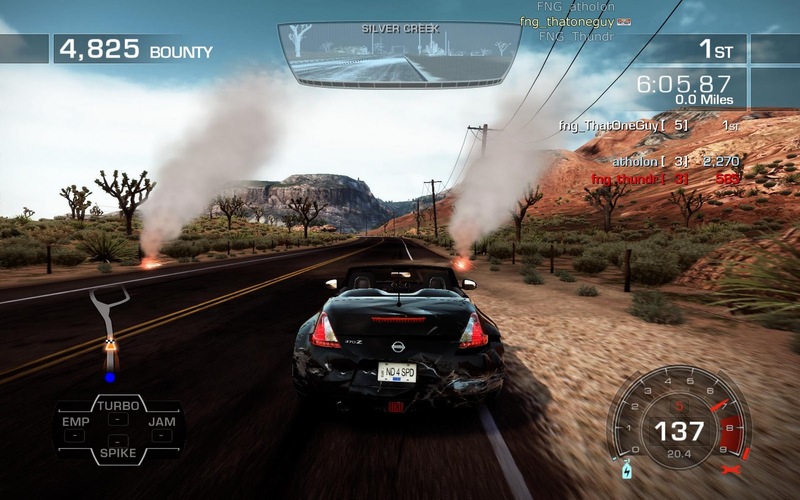 And don't forget to score Need for Speed: Hot Pursuit... we're planning some epic Cops and Racers fun on Christmas night! 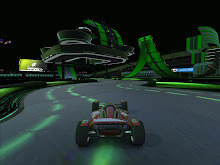 Mistral and Varsity - Two FNG TrackMania author faves; and MCM2 on Windows 7 a reality? 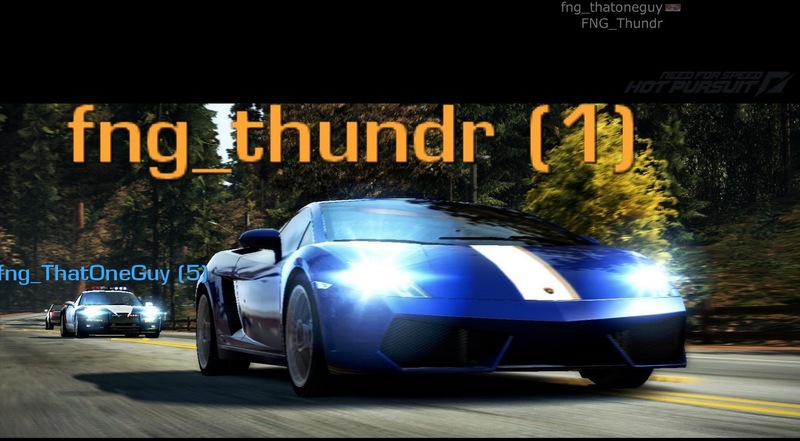 Thundr, Beuchety and I raced tonight on the Mistral World Selection server. DirtyDan, Thundr and I had played that server last week with about 50 other people and had a ball! Even the server host (and excellent track author) raced with us that night. We had so much fun we had to run it again this week. 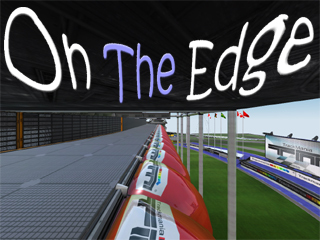 The server had less than 10 people for most of the time, but they were cool racers and we didn't have any repeats of the tracks from last week. All were fresh and fun. When I looked through my browser tabs to see the other tracks I'd queued for download after our session (there were four of them) ... I discovered that two of them were from the same author; named Varsity. We enjoyed Varsity's tracks so much tonight, that we downloaded the two we played, then found two more on TMX that were his highest awarded tracks. I'm thinking we should put up our own server next Friday and run those (among others we've newly downloaded. Some would make great tournament material. So join us next Friday for some fast/frantic Mistral and Varsity tracks. In other most excellent news. I figured out a way to get Motocross Madness 2 to run for those that have Windows 7 machines that will only do Software Rasterization in MCM2. 1. Supports DirectX 9.0c with a virtual 3D adapter. 2. Allows you to create your own Virtual Machines. I tested on my i7 laptop (ATi Radeon 5870, 8GB RAM) by creating a Windows XP VM, installing MCM2 and played at 1920x1080 @ 30fps! Note, there are still some visual anomalies in the menus, but we were all getting those in XP as well, so we'll suffer through them. I would like other FNGers to please try this, if you have an XP license to spare on a VM and see if you get the same mileage out of this solution. This may very well help us bring MCM2 back into FNG play! 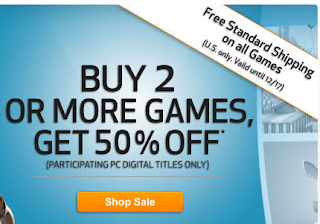 Free shipping on digital downloads... how generous!